Very nice foot spa! We use it at least 3 nights a week. Great price & works consistently. Easy clean up too. You will love it! 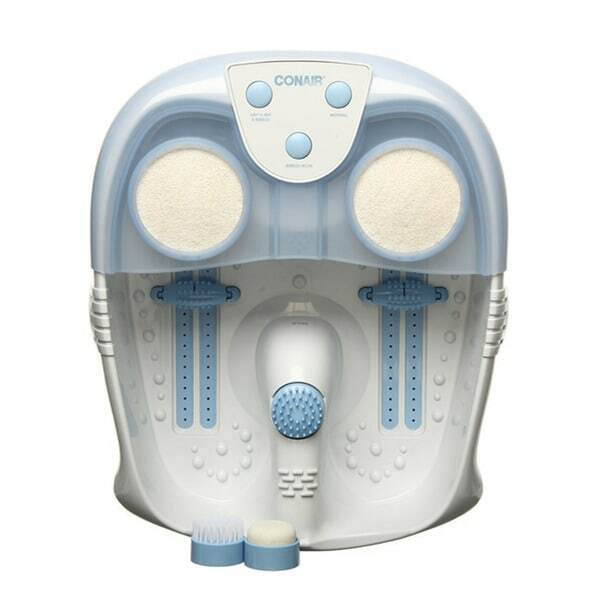 Get a relaxing spa-like experience in the comfort of your own home with this foot bath from Conair. This hydrotheapy bath has a waterfall for the top of your feet, various attachments and a calming blue LED light. I have used the Foot Bath (2) times now. The bubbles seem to have two speeds, high and higher. Maybe I am putting too much smelly stuff in the water, it could be all me. I can only have the bubbles on for seconds or all overflows. I really just use it to soak my feet, any tub would do for this purpose. The waterfall or whatever they are calling it is a joke. You have to look down to see if it is even working because you certainly don't feel it. I will get my $40 worth then replace with a better quality foot bath. That could be 2 months from now or 2 years. Overall, I do love it. I’ve been wanting to get a foot spa for a good minute. I don’t like the detachable massagers in the bottom of the spa, but, good news, the pieces that hold them are also detachable. Also, for the life of me I can’t get the bubbles hi/low to work, but the led light/heat/bubbles works with one push. The waterfall is also a nice touch. I’ll be getting a lot of use out of this. This is a very effective foot massage. The waterfall feature makes all the difference. The rollers under my feet feel so relaxing. I have a luxury spa experience in my home every time I use this. I would recommend this to anyone. It works great and the additional pieces included is helpful in keeping you feet feeling like a baby's feet. It's worth the money and you will love it. IT IS WONDERFUL FOR NEUROPOTHY, OR JUST SORE AND TIRED FEET! I’m very impressed with this foot spa. I have fibromyalgia and this really makes your feet feel so good and helps you to relax. Would definitely recommend if you have sore feet. This product is exactly as it described and provides a relaxing spa treantment. The price is very competitive and it's great after a night of wearing 3.5 inch heels! Gave it to a my nephew who is on his feet almost 12 hours a day - walking on cement a lot. He says it does wonders for his feet. Loves that it keeps the water warm and that he can massage the bottoms. Good buy. Not overly thrilled with this purchase but after seeing the dismal amount of money I got returning another product, I'm going to keep it. It doesn't keep the water warm, and the nubs on the bottom actually hurt my feet. The roller attachments that are supposed to "massage" actually feel like needles poking my soul (sole ..bud um bum). I wouldn't recommend this purchase to anyone with soft feet. Shame though. I was really looking forward to it after the other reviews. Does not keep water warm by any means, however, it really is very nice otherwise. Wonderful for the feet. Nice and roomy, I am a size 9. It appears up to 11 you'd be just fine, over that not so sure. Be sure to add warm to hot water it really doesn't heat or maintain temperature. Love this. The bottom was a little rough but it definitely did the job. Great for after a hard days work and no time to visit a spa. Sit back and relax. We love this foot soaker/massager. It works really well and highly recommend this item. It got here in two days which was a nice surprise. I have diabetes, so I try hard to take care of my feet. After being on my feet all day, it is nice to come home, relax, and soak my feet! The scrubbing pad holder ring broke and I do not know how to get a replacement. If I can't get a replacement ring the unit is just about useless. No, this plugs into a standard wall outlet.